OK, so if you guys read my Bikram Yoga post, you'll know I've been really fortunate to give a whole host of new workouts a go thanks to Class Pass, and although Bikram Yoga isn't the one for me, I wanted to see if Pilates was. 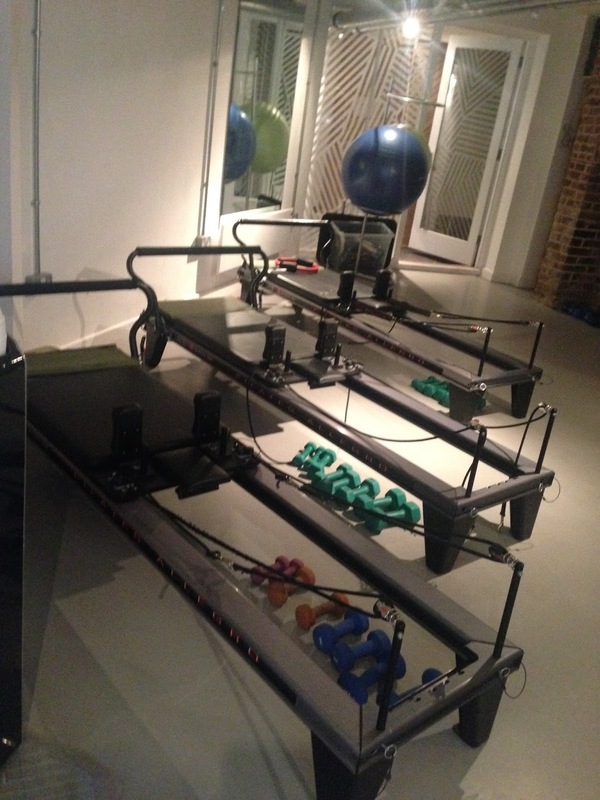 I chose to go to Bootcamp Pilates in Notting Hill as I was really keen to see what it Pilates on the machines was all about and if it would be something I could do alongside my regular workout routine. I've got to admit I was impressed. The inner sceptic in me does wonder how many calories you actually burn during the class as you work up a light perspiration at most, but that being said my muscles ached, felt like they had a good stretch and I left feeling it was a productive hour. Plus it's not all about working up a sweat right, knowing my muscles felt like they were being pushed and challenged and feeling the uncomfortable twinge of a good stretch definitely did something. So let me tell you about the Pilates machines. You spend the whole hour on it, whether you're led on your back, in plank position, or sat upright. It has a movable base that is connected by springs of different colours (indicating different resistance) and it has shoulder pads to ensure you're kept in the right place. It also has a platform and post for helping stabilise you during different moves and some rope slings. These slings have two holes, one you use for your hands and the other for your foot. Then under this machine there are lots of other bits, free weights, bars and resistance hoops etc. When you walk in you're told to choose your machine, and the instructor then gave a quick run through to me and the three other newbies as to how the machine works, what each bit is for and how you use the resistance springs. Then we got to work and the class was a really fluid, enjoyable hour. You do a lot of stretching on the legs primarily and I was surprised by how quickly my legs got used to the stretch and once I'd pushed past what I'd normally consider a good stretch, how much further I was able to push myself. I also (sadistically) really enjoyed pushing through the pain where my muscles have obviously been wound pretty tight. There is also one particular movement where you pulse (as if in squat position) that I actually thought my legs were going to give way I found it so intense, brilliant! After lots of leg stretching, with and without the hoop and slings you then work on your upper body where you sit upright on the machine and are encouraged to keep a straight posture whilst using these ropes to pull yourself back and forth on the machine. It worked everything from your biceps and triceps to your back and lots of other parts I don't even know exist yet I'm sure. What was so great about this class (once I got over the fact I wouldn't sweat out the previous nights alcohol intake) was that I really did think about my body for the whole hour. Literally. I thought about my breathing "breathe in and out to the side, expanding your ribcage sideways rather than raising the chest" we were told, I considered my posture and how much slimmer I seemed when I sat upright with the string in my nose and down through my spine (one to remember for the future). Not to mention thinking about my bodies movements and noticing the pain and how it subsided the longer we held the poses. So, if you haven't established by now, yes I think I may have found an exercise that I enjoyed; it worked my body in a way that it's never worked, enabled me focus on the minutia of the movements we were performing and actually allowed me to zen out a little. I'm pretty surprised at myself too but I totally enjoyed it! I can't say I ache after or anything, but I am aware of what I learnt and I would definitely go again. It's been really great using Class Pass to get to experience a host of new exercise routines. If id taught me anything, it's to stop letting fear of the unknown get in the way and give things a go! Also, each class I've tried there were newbies there just like me, which meant that even though you feel like the odd one out who doesn't know what you're doing, you're not the only one and everyone has to start somewhere. It's also interesting to think that what you may think you're suited to, could be quite the opposite when you give it a go. On paper Bikram Yoga seems like it'd be more up my street, sweating whilst stretching but nope, Pilates and in particular Pilates on machines is great fun and I am seriously considering adding it to my weekly work out routines. Let me know what you've thought about my trial of different fitness classes, if you've got any others you want a bit of an insider take on then let me know, happy to give it a go and then report back on what I thought if this has been helpful.